2017. Eligible/ Interested candidates have to send their application forms to the Office of the Dist Coordinator & Zill Collector, Sikar, Rajasthan on or before 8-December-2017. Application forms available @ Sikar.rajasthan.gov.in. Collectorate Sikar Recruitment notification has released on 23rd November-2017. Pay Scale for Jr. Technical Assistant is Rs. 13,000/- and for Accounts Assistant is Rs. 8000/- per month. Candidate will be selected for Collectorate Sikar Recruitment Accounts Assistant vacancies is based on written examination/ Interview. 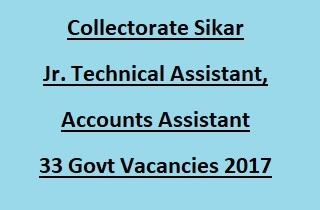 Go through the notification for Educational Qualification details, Age limit, Application procedure, Selection process, Pay Scale, Available vacancies regarding Collectorate Sikar Recruitment 33 Jr Technical Assistant, Accounts Assistant Government vacancies 2017. Last date for offline application submission: 08-12-2017. Total available vacancies in Collectorate Sikar Recruitment Notification are 33 posts. 2. Accounts Assistant: 25 posts. Total no of vacancies: 33 posts. Jr. Technical Assistant: B.E/ B.Tech (Civil/ Agricultural Engineering) or Diploma in Civil/ Agricultural Engineering from recognized university. Check the notification for full details regarding educational qualifications. Please check the notification for Age limit details and relaxations applicable as per govt rules. Pay Scale for Jr. Technical Assistant is Rs. 13,000/- per month. For Accounts Assistant is Rs. 8000/- per month. Candidates will be selected for Jr. Technical Assistant and Accounts Assistant Jobs in Collectorate Sikar Recruitment is based on written examination/ Interview. Go through the Advertisement link for detailed selection process. Interested/ Eligible candidates have to send their application for the specific post through registered/ Speed post before 8th December-2017. Download the application from the official web link Sikar.rajasthan.gov.in. See the notification for detailed application procedure.